NEW GoPro Hero Session Adventure (sealed box). Images - Sound Cupecoy All the classified ads. Record yourself in high performance activities with the GoPro Hero4 silver camera. The Hero4 utilizes an easy to use touch-display for convenience, and captures video and images for 1080p60 and 720p120, among other video resolutions. The camera features 12 MP with up to 30 frames per second. It also has a built in Wi-Fi and Bluetooth with Protune for photos and video. It is waterproof up to 131 feet, for when you are surfing a great wave on your next vacation. Videos are filmed in an MP4 file format and are created from frames captured at set intervals to create a time lapse video. GoPro also has an app that allows you to preview and play back videos and photos. With additional advanced features, this power packed camera is an adventurer's dream. The go pro works but I did not notice on the picture that the menu button was sideways and it was not told in the description. When I received the product I heard rattling and opened it up and then box (with no lid) that the go pro was in was packed really well but when I opened the cushioned package, the go pro and all the other items where loose in the box and bouncing around. I was not happy to see that. 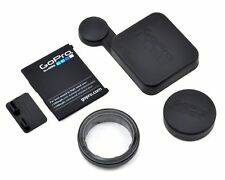 The go pro does work, no charge cord was in the items but was it was not listed either. Thank God for Refurbished items (no matter what the manufacturer). The GoPro Hero 4 gives you an incredibly small video camera that can be used out in the wild with many different adapters (which I got from China for a total of $16) that allow you to mount the GoPro on your chest, head, car windshield. on a floating hand-stabilizer, on a sticky pad which can be placed on any flat surface, on a clip which clips on webbing, on a wrist strap, etc. The quality of the video is MP4; so is very high quality. It is in no way a camera, I would say. Get a camera to do that. But, if you want to videotape long sequences of hiking through wilderness, or leaping from an airplane, or scubadiving, etc. then the GoPro is the one for you. GoPro Hero 4 Silver, great camera, great value for great quality pictures and videos. Extremely easy to use and provides very high quality photos and videos. The videos I post to YouTube are always HD quality if I'm using this camera. Brought my GoPro with me to Thailand. It's very light and easy to pack. However, all of the pieces do not fit in the case. I used it for zip lining, white water rafting, and plan to use it for parasailing. The battery does die quick if you're recording. I carry a portable battery pack with me just incase. It was worth every penny. I highly recommend it!